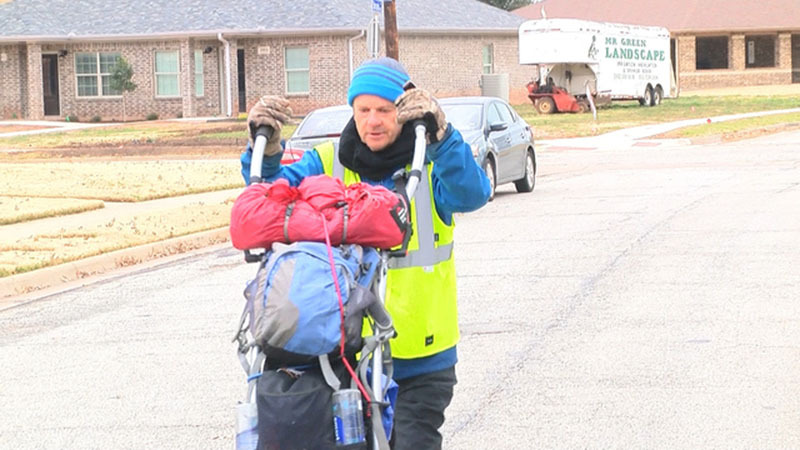 WICHITA FALLS (KFDX/KJTL) – One man is walking with a purpose. That walk is spanning the United States and then across other continents for charity. Tom Fremantle started his journey in San Diego, California in September and it will end in Savannah, Georgia. His goal is to raise awareness and money for the Alzheimer’s Society, Puzzle Centre, which works with children who have autism, and for medical detection dogs. On his walk across the country, the weather has thrown a little bit of everything at Fremantle. Along with helping charities, he is hoping to spread a little kindness on his journey as well. And some of those strangers who have shown Fremantle kindness by opening their home to him are Becky Hernandez and Stephen Acheson. He hopes to reach Georgia before his visa expires in March but he can only travel so far each day since he is walking. Fremantle will leave Wichita Falls and head toward Henrietta tomorrow as he continues his journey across the states. You can find more information about Fremantle’s journey or to donate to any of the charities here. WICHITA FALLS (KFDX/KJTL) - One man is walking with a purpose. That walk is spanning the United States and then across other continents for charity. "Whether it's the incredible heat in the desert, freezing cold in the mountains of Arizona," Freemantle said. "You are completely exposed to the elements. On Boxing Day there was an incredible storm in Seymour, I'm sure you had it here too. I went to do my laundry. You might as well have thrown 12 buckets of water on me I got completely soaked. There was an inflatable Santa that shot down the road faster than Rudoloph." "In a very simple way, I am trying to spread a message of trust," Freemantle said. "As human beings these days, we are all a bit terrified of each other and in a simple way I hope that walking through the country I can spread a message of trust. You are basically relying on the kindness of strangers. That's very much what this walk is about." "I had a friend that called me from Lubbock and a friend of her's had hosted Tom, in the Brownfield area. They knew he was headed to Wichita Falls so she called and asked if I was interested in hosting," Hernandez said. "I looked up his information and saw his cause, Alzheimer’s is near and dear to me and to Steve. We have both lost parents to Alzheimer’s." "With a walk in quite a simple way. Kind of a vulnerable way. I can only cover 20 to 25 miles a day so you just have to take whatever the road throws at you. You can't do an extra hundred miles like if you were in a car. You can't do another 20-30 miles like if you are on a bicycle. You just have to take whatever the road gives you." You can find more information about Fremantle's journey or to donate to any of the charities here.